Who doesn’t like a good spy novel or film? 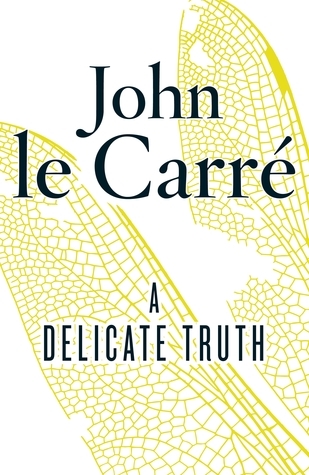 This new book trailer for John le Carré’s new spy novel A Delicate Truth has it all. A Delicate Truth hits stands May 7th. The book trailer is especially bitchin’. It’s directed by Kim Gehrig and produced by le Carré’s son Simon Cornwell (of Ink Factory Films), and involved in the production were James Foster (Art Director on Skyfall), Andy Shelley and Stephen Griffiths (Sound Editors on Tinker Tailor Soldier Spy), and Mark Paterson (Oscar-winning Sound Mixer on Les Miserables). A Delicate Truth by John le Carré — Official Book Trailer from Viking Books on Vimeo. A DELICATE TRUTH has already been deemed “The Most Anticipated Book of 2013” in the United Kingdom, topping the 2013 preview lists in every major newspaper, and Viking’s publication will be one of the biggest literary events of the year. The story of A DELICATE TRUTH unfolds over three years. A British civil servant is dispatched to Gibraltar where a top secret counter-terror operation (codename: Wildlife) is being mounted. He has been assigned by a Minister of Her Majesty’s Foreign Office to be his eyes and ears on the ground. The mission is so delicate that not even the Minister’s private secretary, Toby Bell, is admitted to the plan. The operation goes off without a hitch. Or does it? Three years on, Sir Christopher “Kit” Probyn, a former British diplomat, is enjoying his well-earned retirement. Brought face to face with a living ghost from his past, he desperately appeals to Toby for enlightenment. With the surreptitious help of Kit’s daughter Emily, two men a generation apart, both loyal servants of the Crown, will separately discover whether Wildlife was the triumph it was made out to be, or a tragedy ruthlessly suppressed by the Foreign Office to which they owe their allegiance. This year has already seen the Penguin republication of two le Carré novels, The Looking Glass War and A Small Town in Germany, (concluding Penguin’s publication program of eleven backlist le Carré titles). This fall (September) will be the 50th anniversary of the novel that brought le Carré worldwide attention, The Spy Who Came in from the Cold, as well as a feature film adaptation of A Most Wanted Man, starring Philip Seymour Hoffman, Rachel McAdams, Willem Dafoe, and directed by legendary photographer and filmmaker Anton Corbijn. In addition, le Carré has recorded the audio book of A DELICATE TRUTH, the first time he has ever read an unabridged edition of one of his novels. 2013 will be a banner year for this extraordinary writer. John le Carré was born in 1931 and attended the universities of Bern and Oxford. He taught at Eton and served briefly in British Intelligence during the Cold War. For the last 50 years he has lived by his pen. He divides his time between London and Cornwall.